Discussion in 'Pokefarmer Forum' started by Mew2, Dec 29, 2016. I have attempted to do the complete botting guide on London. If you see the River Thames mentioned expect Water Pokemon, including Magicarp and if your lucky Dratini. Stay in one area, or do the tour. Typically I'd try and stock up on Pokeballs in the first area due to the vast amounts of Pokestops, then catch about 100 Pokemon in each area, before going onto the next. My suggestion is to wake up in the morning and set the kill switch for 4 hours (240 minutes), and bot in Area 1 to stock up on Poke balls and Star Dust. Go to work / school, then in the afternoon set the bot to work in one of the other areas for another 4 hours. Always have at least one day off a week where you don't log in the account. If you are here for Mr Mime, your best bet is Area 1. 17th February 2017 - 14th Migration update. Area1 = Not a nest but a general area. Mr Mime & Ditto. Area2 = Not a nest but a general area. Queen Elizabeth Olympic Park: ? Also Covering: City of London , St Bartholomew's Hospital, St Paul's Cathedral. Radius: 750 metres (0.750 KM) - Settings, General tab to adjust. Bike Speed: 21 km/h (5.8 M/S) - Settings, General tab to adjust. Excellent for filling your bags up, there are loads of Pokestops about. Excellent for Mr.Mime, out of every 100 Pokemon caught 3-4 will be Mr. Mime based on my experience. Great place to farm Star Dust due to Pidgey and Rattata everywhere, and Ditto as a result. Personally I'd dump all items apart from Pokeballs and Max Potion and Max Revive. Make sure your bags are full of Pokeballs for the journey ahead. Typically the bot "should" head South towards the River Thames. Distance between London Museum and the Tower of London = 1.4 miles. Log off for 5 minutes. Radius: 225 metres (0.225 KM) - Settings, General tab to adjust. Lots of Poke stops in a small area, and is known to have rare Pokemon. Distance between Tower of London and Waterloo Station = 2.3 miles. Log off for 5 minutes. Also Covering: London Eye, River Thames, London Dungeon, Jubliee Gardens to the West. With Archbishop's Park and St Thomas' Hospital to the South West. Finally we have Geraldine Mary Hamsworth Park / Imperial War Museum to the South East. The London Eye (the square thing in the water just below the trainer on the map) in the above picture, often gets a mention as a good place to catch rare Pokemon, Jubilee Gardens next to the London Eye, the green patch of grass below the trainer in the picture is an Omanyte nest. Archbishop's Park to the South West and, Geraldine Mary Hamsworth Park / Imperial War Museum to the South East (Doduo nest), often have nests in them. River Thames is good for Magicarp and "general" Water Pokemon. Distance between Waterloo Station and Kennington Oval = 1.6 miles. Log off for 5 minutes. Also Covering: Kennington Park, Vauxhall Park, Vauxhall Pleasure Gardens. 750 metres - Radius (0.750 KM) - Settings, General tab to adjust. 21 km/h - Bike Speed (5.8 M/S) - Settings, General tab to adjust. To the South West you have Vauxhall Park, which is an Omanyte nest. 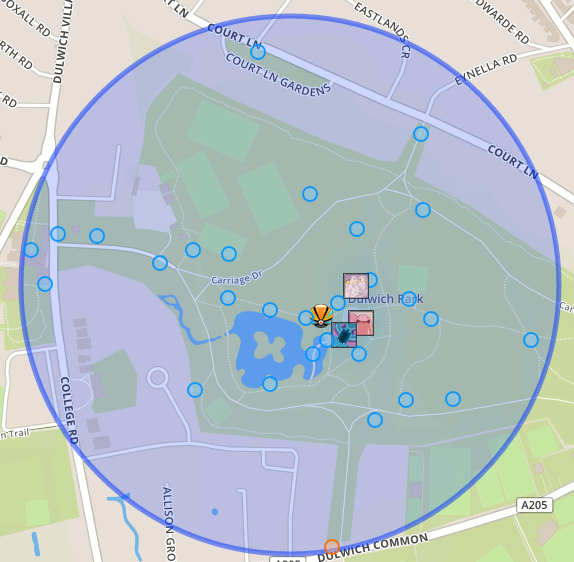 To the South East you have Kennington Park which is a Magmar nest. Distance between Kennington Oval and Buckingham Palace = 2.0 miles. Log off for 5 minutes. Also Covering: Queen Victoria Memorial statue, The Green Park, St. James's Park / Palace / Gardens, City of Westminster. St. James's Park to the East, often good for different types of water Pokemon. At the end of St James's Park (to the East) is Downing street where Prime Minster Theresa May lives. City of Westminster to the South where all the politicians are. St James Palace to the North if you wanted to visit Prince's William, and Harry. To the North West is the Green Park a Pikachu nest. Buckingham Palace to the South East, best not go there incase the Queen's guards shoot you. Nice area to be honest, it's hard to escape the center due to the frequent spawns! 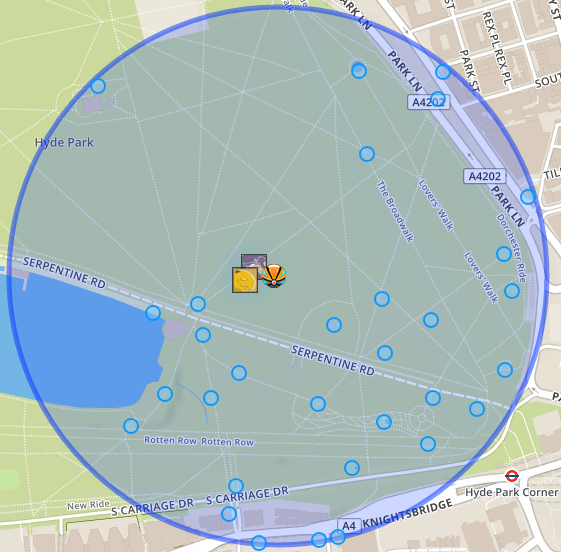 Distance between Buckingham Palace and Hyde Park East = 0.5 miles. Log off for 2 minutes. 400 metres - Radius (0.400 KM) - Settings, General tab to adjust. Hyde Park East. Good spawn rates, lots of Pokestops etc. Distance between Hyde PArk East and Battersea Park = 1.5 miles. Log off for 4 minutes. A great place to play the game, lots of Pokemon and plenty of variety, currently a Doduo nest. Really good place, love it . Make sure you do the 5 Poke stops to the south east, and the lake. Distance between Battersea Park and Wandsworth Park = 2.8 miles = Log off for 6 minutes. 300 metres - Radius (0.300 KM) - Settings, General tab to adjust. Added 14th January 2017. As of the 11th migration this is a Machop nest, you will walk around the park in a circle as the Pokestops are on the outside. Picking up Magicarp as you go. Distance between Wandsworth Park and Bushy Park 7.8 miles = Log off for 16 minutes. Bulbasaur Nest with lots of bug type Pokemon. Not that many Pokestops, but a good place for egg hatching. Distance between Bushy Park and Kew Royal Botanic Gardens 6.0 miles. Log off for 13 minutes. 600 metres - Radius (0.600 KM) - Settings, General tab to adjust. Nice big area along the River Thames. Currently an Abra nest. Distance between Kew Royal Botanic Gardens and Holland Park= 5 Miles. Log off for 11 minutes. 225 metres - Radius (0.225 KM) - Settings, General tab to adjust. 21 km/h (5.8 M/S) - Bike Speed (5.8 M/S) - Settings, General tab to adjust. Magnemite nest, helps you get your Steel badge. Excellent for Charmander, Bulbasaur, Squirtle and Pikachu. A superb small park. Loads of Poke stops in a small area, and quick spawns. Distance between Holland Park and Kensington Gardens = 1.0 miles. Log off for 4 minutes. Superb area for lots of different type of Pokemon Jynx, Magicarp, Nidoran etc. Dratini's can pop up here along the river as well. Distance between Kensington Gardens and Regent's Park= 2.5 Mile. Log off for 6 minutes. Not many Pokestops in the middle, but huge clusters to the north, east and south. You should start walking south, then east, before looping up north. Distance between Regents Park and Hampstead Heath = 3 miles. Log off for 7 minutes. In the middle to the North, you will see two small ponds (below Kenwood House), make sure you visit them as to the right of the pond, on the right you can sometimes find Dratini. Distance between Hampstead Heath and Waterlow Park = 1.3 miles. Log off for 5 minutes. 350 metres - Radius (0.350 KM) - Settings, General tab to adjust. There is no specific nest here, but you will catch a lot of Clefairy, Nidoran, Paras, and Horsea. Distance between Waterlow Park and Alexandra Park = 2.5 miles. Log off for 6 minutes. Also common to find Nidoran's. Distance between Alexandra Park and Finsbury Park = 2.5 miles. Log off for 6 minutes. 500 metres - Radius (0.500 KM) - Settings, General tab to adjust. Added on 14th January 2017, during the 11 migration. It's currently a Seel nest. Distance between Finsbury Park and Haggerston Park = 3.2 miles. Log off for 7 minutes. Added on 14th January 2017, during the 11 migration. You will get a mix of Pokemon here, including a few Mankey. Distance between Haggerston Park and London Fields = 0.8 miles. Log off for 2 minutes. Added on 14th January 2017, during the 11 migration. You will get a mix of Pokemon here, including a few Bellsprout. Distance between London Fields and Victoria Park = 1.5 miles. Log off for 3 minutes. 450 metres - Radius (0.450 KM) - Settings, General tab to adjust. Added on 14th January 2017, during the 11 migration. Excellent area, with lots of Pokemon across a massive space. Victoria Park is a great area for water Pokemon including Horsea, while Staryu can be caught in Mile End Park. Distance between Victoria Park and Queen Elizabeth Olympic Park = 1.9 miles. Log off for 4 minutes. Added on 14th January 2017, during the 11 migration. It's currently a Scyther nest. Distance between Queen Elizabeth Olympic Park and Dulwich Park = 7 miles. Log off for 14 minutes. 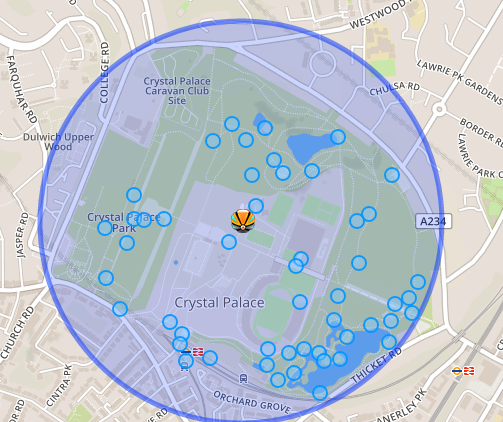 Distance between Dulwich Park and Crystal Palace = 1.7 miles. Log off for 4 minutes. Firstly, this is not London. This is England's second largest city. Still it's a great area, with stops and you can get Mr.Mime here. Trafford shopping Center, lots of Poke stops in a small area. In Pokemon Go terms Cardiff is very similar to The city of London (London Area 1). As you head to the right hand side of the first photo, you will encounter huge amounts of Rattata, Pidgey and Spearow, ideal for farming Star Dust and Ditto candy, as well as Mr Mimes. Bute Park to the west is an excellent area to catch Pokemon, it is currently a Bellsprout nest. Dratini is also far more common in Cardiff than London in my experience, a few often spawn in the grass to the left of the Castle, near your log in location (see bottom left of second picture). Finally there also seems to be a tendency to have high IV Pokemon around Cardiff. Distance between Cardiff Castle and Cardiff Bay = 1.5 miles. Log off for 5 minutes. Cardiff Bay is a little gem, Magicarp are common here most of the time, Dratini can also be caught along here. Excellent area with tons of Pokestops. Distance between Edinburgh Castle and the Edinburgh Zoo = 3.5 miles. Log off for 7 minutes. I need to get a nice cheap responsive VPN service compatible with PF and "travel" to London. Any suggestions? Any UK Vpn should do though, the distances are hardly that big. London to Moscow is basically the extreme east to west of Europe, yet it's still 1000 miles shorter than Los Angeles to New York. I made some more adjustments to this today. These are all good info. Thanks Mew2 They all look like pretty high density area for farming. *Note: Poster accepts no responsibility or liability for any Poke trainers bayoneted up the rear end as a result of skipping across Her Majesty's lawn. If your caught kicking one of her Corgi's your off to the Tower! In the event you do get bayoneted up the rear then were off to the Royal Hospital next anyway... - I like this warning or disclaimer, lol, I hope that they don't bayonet my bot or I will have to purchase a new key. Thanks Square, most are pretty good ones. I'll be adding more in as I go. Big thank you for this guide. I moved (with the bot and Locationfaker on my iPhone) from my hometown (in Germany) to London because of this guide. 8) Kew Royal Botanic Gardens made much more efficient. Edinburgh Zoo / Castle added. Woooww great work buddy! Thanks for sharing all of these. I have recommendation who wants to farm in Uk or any places. For instance: I'm living on Turkey and wants to farm on UK, closing program for at least 8-9 hours or don't open PGO on phone. Than i'll set on map for UK that i wanna farm place and don't use any proxy for it. And sometimes it's asking me to solve captchas but not too much. So it doesnt matter where you're just don't open your acc on phone with gps and that's it! so don't worry to farm any places. just calculate your fly time like using plane one country to another. And wait at least 7-8 hours to start PF on another country. And stay there at least 2 days. Updated to the 12 Migration. Could you just tell me: British radar or map pokemon okay? i'm in VietNam. i wana play in London or any city of England. Wandsworth Park has been added (Area 7), as it's a Machop nest. Also added Finsbury, and Olympic Park. Bushy Gardens, and Kew Gardens improved. Haggerston, London Fields, and Victoria Park added. Not sure how family you are with Birmingham but I'll try and describe it as best I can without a screen shot. You definitely want gas street (Brindley Place) and St Paul's Church within your radius, as well as the children's hospital. Magikarp farming galore at Brindley Place (canal side bars/restaurants) as well as a squirtle nest. Chanseys are a regular occurrence at the children's hospital and St Paul's tends to have a lot of fire pokemon (charmander and growlithe) I understand why the bullring has been chosen, as the footfall is pretty high, but these spots tend to produce better pokemon, so have a higher density of actual players. I use a 600m radius to catch most of them, but it shouldn't matter too much as long as Birmingham Cathedral is included in the radius, as that's possibly the main spawn in Birmingham.